Nancy Boren - 2nd Place in Bold Brush! A big shout-out to Nancy Boren!! Her painting, "Aloft in the Western Sky "- won 2nd place in the February. 2014 Bold Brush competition. Congratulations Nancy! Well done! O P S: THE BEGINNING……..
Back in 1996 Bruce Peil and Dave Bates were sitting in Bruce’s living room lamenting the fact that even though most of the artists they knew were often heard saying - “We should get together and paint outdoors sometime” - it hardly ever happened. So the two of them came up with the idea to start a group dedicated to outdoor painting….and the “Society of Outdoor Painters” was formed. A short time later the group changed the name to OPS (Outdoor Painters Society) but originally it was the “SOP”. 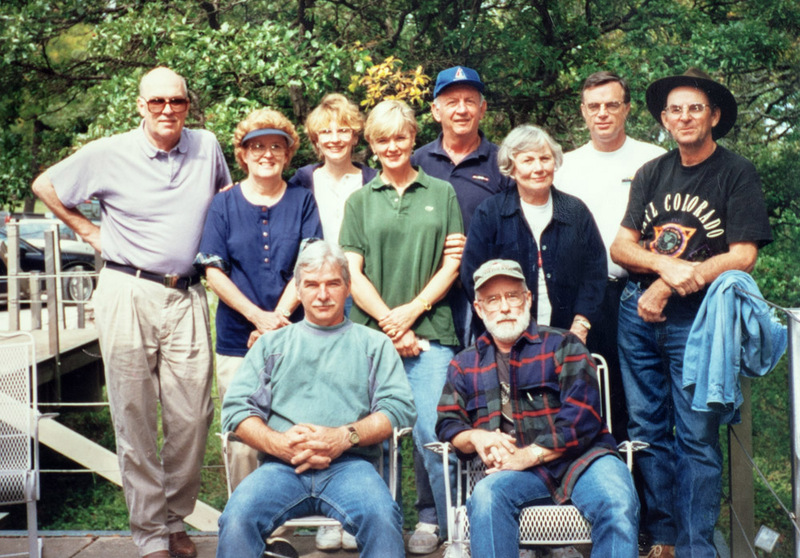 Dave & Bruce got together with a mutual friend, Marian Hirsch, and worked out what was needed to do to get the ball rolling and the group had their first outing October 5, 1996 at the home of Jerry and Suzanne Owens on Lake Texhoma. Originally, OPS had nine charter members at that first outing: Bruce Peil, Dave Bates, Jerry and Suzanne Owens, Marian Hirsch, Jim Rozek, Chuck Rawle, Ken Barry and Barbara Park. The group continued to paint together with just a handful of members for a while, until their paint out at White Rock Lake in Dallas. This paint out is where they were “discovered” by a reporter for the Dallas Morning News who thought the group might make a good story. The paper covered their next outing and the article appeared the following weekend. “After that the membership took off and started growing faster than we could keep up”, Dave said. Bruce agreed; he said, “We put a cap of 100 on the size and established a waiting list. After a while we removed the cap and the membership took off again”. According to Dave & Bruce, the original purpose was to simply provide incentive and opportunity to artists who wanted to paint together en plein air and they adhered to that philosophy for several years. But, after opening up the membership and as it grew, a number of members indicated they’d like the group to become more professional, so the idea was put before the membership. “We received a significant feedback of negative opinion” said Dave. “About half (according to a formal survey) wanted to keep it casual, so we backed off those plans.” Bruce added, “we actually had some members drop out when they saw we wanted the group to become a more professional organization.” But the idea didn’t go away. “In spite ourselves”, Bruce reflected, “OPS began to gain a national reputation so we re-organized, establishing officer positions, a board of directors and signature/associate memberships”. “And, as the saying goes, the rest is history”, Bruce said with a grin. Dave’s primary contributions during those early years were keeping the membership rolls on a computer, establishing a newsletter (paper at first, then electronic) and a website (with help from Fran Ellisor). Bruce was the treasurer. He collected the dues and kept a log of who had paid and when, as well as new members who joined during the year. Then he sent a copy of the paid members to Dave to be entered into the computer. Both Bruce & Dave planned the monthly outings. “All good things take time” – is a saying that everyone has heard and there is no doubt that Dave & Bruce “getting together” to paint on location was a “good thing”. OPS is now a nationally known plein air artists organization with a membership of over 300 members. ......And it all started with two good friends with a passion for painting en plein air. Thanks, Dave & Bruce – your “idea” was a good one! Note: The following is an excerpt from a blog post by John Pototschnick. Has plein air painting become the new impressionism? 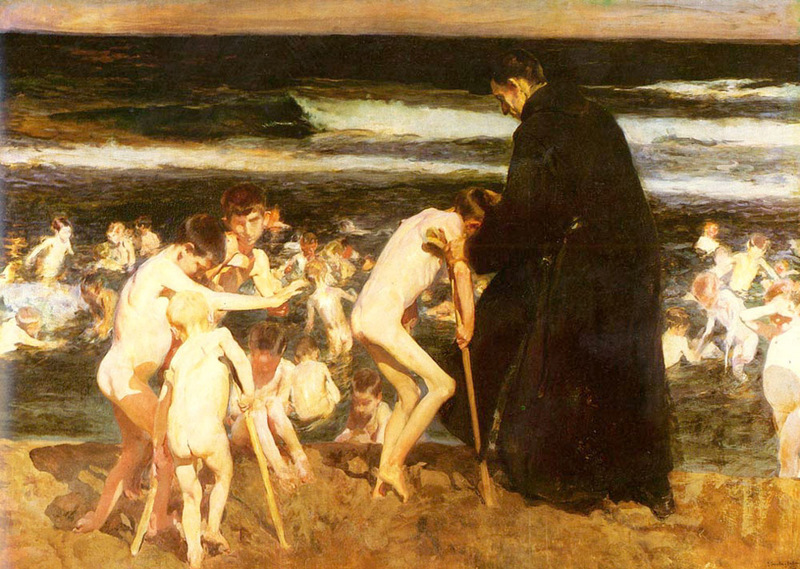 When I began my fine art career in the early 80′s, Impressionism was all the rage. Galleries began identifying their artists as Impressionists, and many artists jumped right on the bandwagon with them. Whether they were impressionists or not didn’t really matter because just about everything was being identified as Impressionism. The public ate it up. 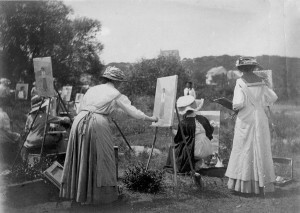 Are we seeing the same today regarding Plein Air? We’ve all seen photos of artists, standing before the motif, with a highly detailed painting on a large canvas…clearly suggesting that the work was done en plein air. Plein air painting has become a badge of honor, a status symbol. Collectors today seem to be asking more and more, “Is this painting a plein air piece?” Plein air painting is the new “in thing” and plein air painters are coming out of the woodwork. 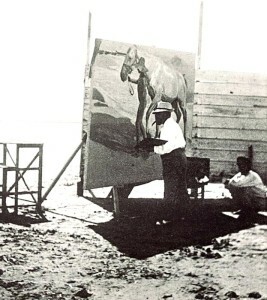 Because of its popularity, in some cases, paintings are being passed off as having been done in plein air when indeed they were not. The galleries and artists aren’t the only ones culpable in this, as I believe part of the problem rests with plein air organizations and those hosting such events. It’s very possible that I’ve missed it, but I am not aware of any of these organizations actually defining, definitively establishing what qualifies as a plein air painting. I’ve heard that at least 50% of the painting must have been completed outdoors in front of the subject, while others declare it’s all or nothing with absolutely no studio work allowed, even for touch-ups. If a clear, consistent definition were established, I think it would be a good thing and could help us avoid creating a “new Impressionism”. Plein air work is an absolute necessity for any landscape painter, but as I have seen many times, it can be a crutch that the artist leans on, giving them a sense of security and accomplishment, when in reality there exists an inability to go beyond the sketch toward the creation of a highly refined studio painting based on that outdoor work. OK - Forget everything I’ve said. I’m a firm believer in plein air painting. Who cares about the finished product. The more painting done in plein air the better. NOTE: This post is authored by OPS Signature member, John Pototschnik and shared with his permission. The rooms were softly lit and human voices were as whispers…distant and subdued…yet the sound was deafening. Despite the noise, there was present a prevailing sense of awe and respect…maybe even reverence. I was standing in the presence of greatness…a giant. 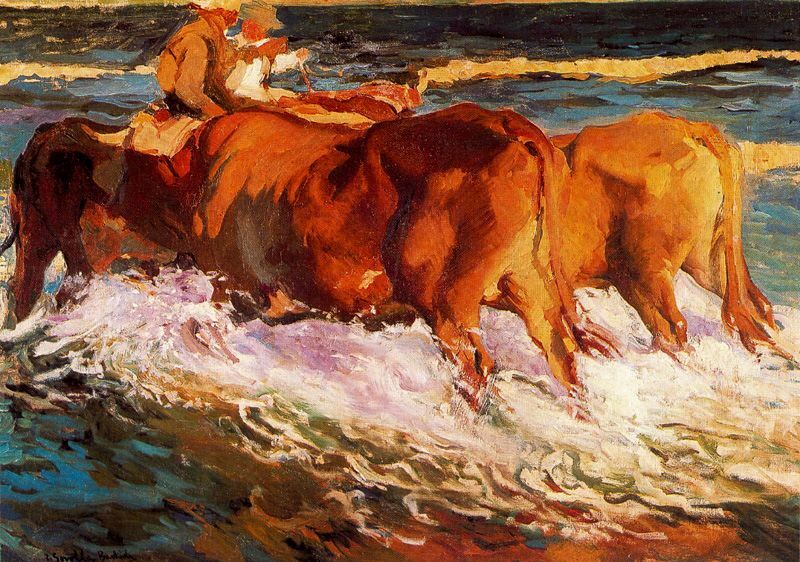 There in those softly lit rooms, at the Meadows Museum in Dallas, hung the illuminated works of Joaquin Sorolla y Bastida, an artist of extraordinary brilliance. 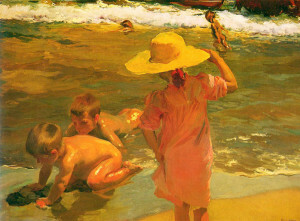 I had the privilege of enjoying the Sorolla exhibit with my wife, and with artist friend, David Griffin. You’ll be learning more of him in an upcoming blog post. However, being an artist himself, I appreciated his company, keen observation and sensitivity to nuances so wonderfully expressed through Sorolla’s brush. 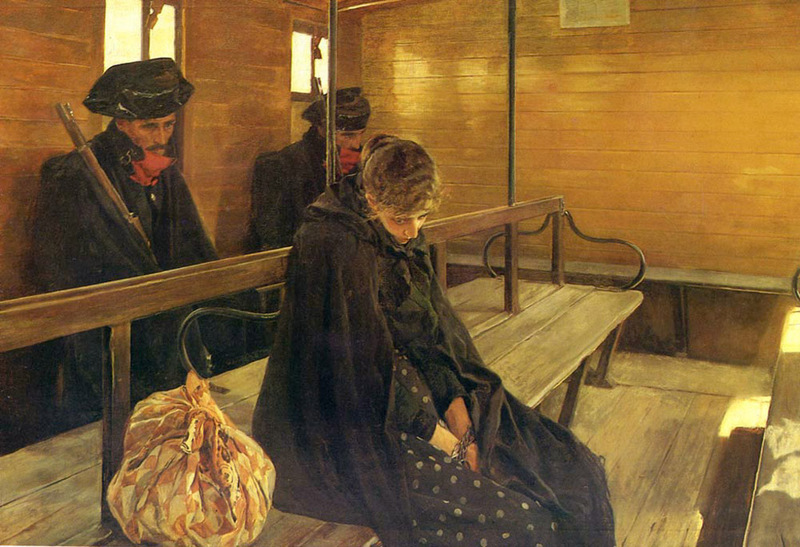 My wife on the other hand, being practical, down to earth, and not impressed by big names, was not enamored with everything Sorolla painted…as I pretty much am. Periodically, I would hear her say, “That’s just not clear, I would never buy that.”…as if we could!!! 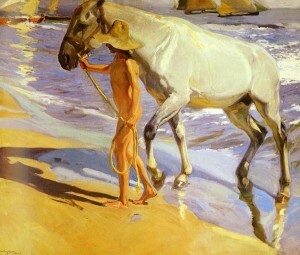 Much could be said about Señor Sorolla’s work. If it’s true that paintings reflect an artist’s personality, then Sorolla’s sheer exuberance for life, family, and the joy of painting did not escape me. His work exhibits massive confidence and knowledge, most evident in his drawing ability, risky compositions, and use of color. His paintings cannot be ignored for there is an authenticity and honesty that comes through with every stroke of the brush. He must have been a man of depth…bold and boisterous, while at the same time, sensitive and caring. In this regard, I was intrigued by his very tiny “painted notes”, some smaller than five inches, broadly and rapidly painted (probably in minutes) yet with his signature so sensitively and clearly signed that one almost needs a magnifying glass to decipher it. 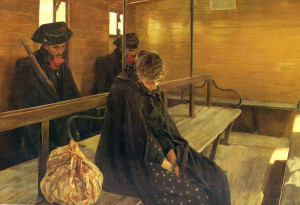 “Sad Inheritance” – 83″x 112″ – Oil (1899)…Grand Prix and Medal of Honor at Universal Exhibition in Paris; Medal of Honor at National Exhibition in Madrid. 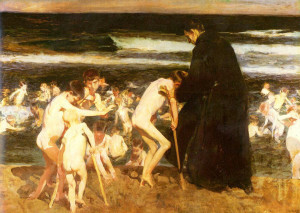 When standing before any great work of art, in this case Sorolla’s, it’s sort of bitter sweet. Sweet, to see such amazing work and to marvel that one can have such incredible talent and ability. Bitter, in that it’s a very harsh reality check when confronted with one’s own lack of knowledge and ability. Do any of you artists ever feel that way? 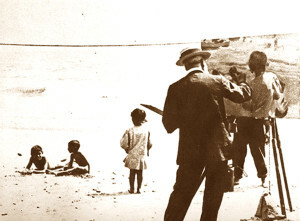 Just a partial view of the 14 murals Sorolla produced en plein air for the series “The Vision of Spain”, now installed in the New York Hispanic Society of America. Those of us that occasionally paint en plein air understand what it takes to create just a small study on site. 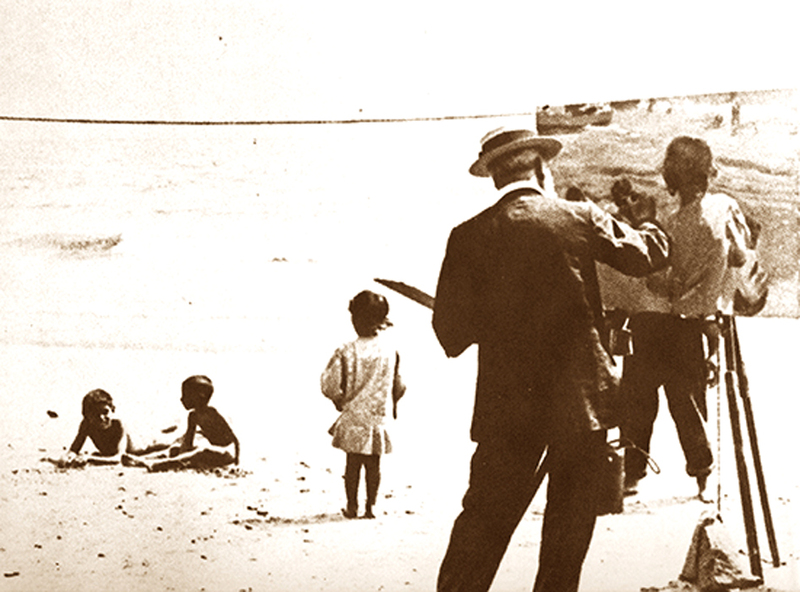 Compare that with the jaw-dropping work Sorolla created en plein air. Consider the 14 massive murals he produced depicting several Spanish provinces…14 feet in height, totaling an incredible 227 feet. What is that, just over two football fields? All, en plein air mind you. If there are ever any allusions of personal greatness, this knowledge alone should bring us back to our senses. Right now, I’m feeling pretty small.